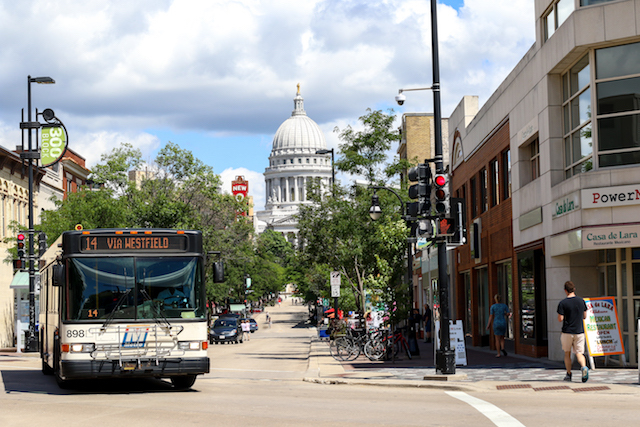 New technology provides access and challenges to Madison’s bus system that must be adopted if Metro Transit is to be a viable transportation option moving forward. A major reason ride share companies such as Lyft are popular is that they made early use of smartphone technology, which enables riders to solicit a ride from/to anywhere at any time and pay via a credit card or similar cashless electronic transfer. Public transit has the competitive advantage however, IF it used smartphone technology as adeptly. After all, most people would prefer to pay $2 instead of $10 for the same ride. Before the era of smartphones, transit riders had been pining for years for Metro Transit smart cards. Smart cards (such as Wiscards) are a special type of pocket-sized card embedded with an integrated circuit that enables the owner to load it with money. Every time it is used subsequently, the cost of the transaction is automatically deducted from that initial balance. With a Metro smart card, riders would not need to carry exact change, a ten-ride card, a current 31-day pass or a year-long pass. They could load or reload the card every week, month or year depending on their budget, anticipated bus use and related factors. When instituted correctly. transit agencies could benefit as well, without eliminating the cash fare option. It is simpler to administer fewer fare options and allows buses to run faster. A few years ago, when Metro updated its fareboxes, it made sure it could use smart cards. And recently, Metro went public with a pilot program in the hope that its MyRapid pass could become standard. However, the video demonstrating use of the MyRapid pass suggests that there would be no time savings over gliding a standard 31-day pass through a groove in the farebox. The main time savings would only come if cash were no longer a fare option, which would be a step backward for bus riders. Unfortunately, given the advent of smartphones, the time for smart cards may have passed. Metro Transit has already adopted several smartphone “apps” related to routing, scheduling, tracking and planning a trip but needs to go further by adopting such features as “all-door” boarding, something that is now possible a smartphone app. Take for example San Francisco’s app called MuniMobile. As with a smart card, MuniMobile enables you to buy tickets with a credit/debit card or PayPal account. Buses are then equipped with scanners on bus doors that riders tap with their phones to pay fares as they board. This can speed up bus travel significantly as riders avoid having to carry cash. In addition, San Francisco charges less for a ride if someone pays with a smartphone than with cash. Another major use of smartphone technology is in enhancing the ability of blind or visually-impaired people to ride the bus. Before smartphones, Metro had been limited to using such features as special enunciators or easier-to-see brighter banners on the front of buses. Enunciators inside buses theoretically called out the name of the next bus stop, although they actually sometimes called out the name of the last stop. Enunciators on the outside would announce the bus’s route at a stop when the bus doors opened. In the last few years, there have been a number of apps designed specifically for bus use by blind or visually-impaired people. One app that appears particularly useful is called the public transit assistant designed by researchers at the University of California-Santa Cruz. The app does not require the Internet or GPS. The rider simply has to be within range of a WiFi access point that can be installed at bus stops or on buses. The public transit assistant is easy to use. First, people can preselect their desired bus line and destination via a specially designed accessible interface. Then, the app guides the user toward the bus stop. If more than one bus stop is within range, the app will ask the user to select one. The public transit assistant provides information regarding the layout of the bus stop including if there are benches, shelters, or potential obstacles. While waiting for the bus, the user can ask the system as many times as needed when the bus will arrive, which minimizes the chance that the bus will pass by without stopping. When the bus arrives, the app alerts users and guides individuals to the bus’s access point. Once on board the bus, users can get as many updates about upcoming stops. The app also tells users when they are approaching their stop before the final destination to allow enough time for them to pull the stop cord and head to the door. Today, many people use their smartphone for daily tasks. If Metro Transit adopted new smartphone technology, public transit could become more accessible. In doing so, Metro could help move Madison toward being a city where one can lead a good life without having a car or using a ride share.